PC-086 Serenity Perfect Chair from Human Touch. "I just wanted to offer a little praise and feedback! 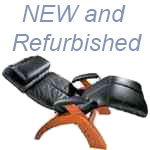 I had been shopping around for this chair for some time and am very pleased with not only the price but the quality of the refurbished chair I received through you. It's wonderful, your service and delivery are fantastic. I wouldn't hesitate to order from you again. Thank you" - Beth S.
"I received the green leather Perfect Chair this morning. Its condition was quite acceptable. I think I will be quite happy with the chair. There were only a few relatively inconspicuous scratches on the wood. I think I will be able to blend them into the finish with a little effort. Your's truly, Norm C."